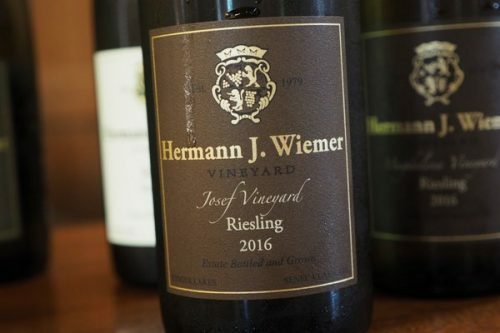 Hermann J. Wiemer is one of the champions of Riesling in the Finger Lakes. He hailed from Bernkastel in Germany, where his father was the head of the agricultural research station. 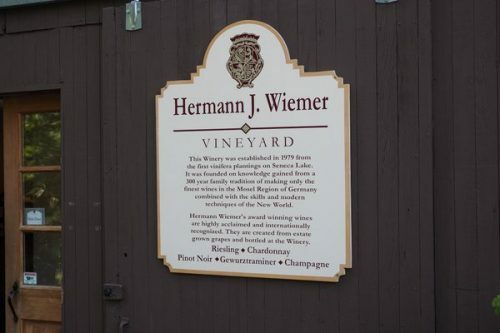 Hermann studied at Geisenheim and then left Germany while he was still in his 20s, emigrating to the USA and planting a Riesling vineyard on the shores of Seneca Lake in 1976. We visited with co-owner Oskar Bynke. 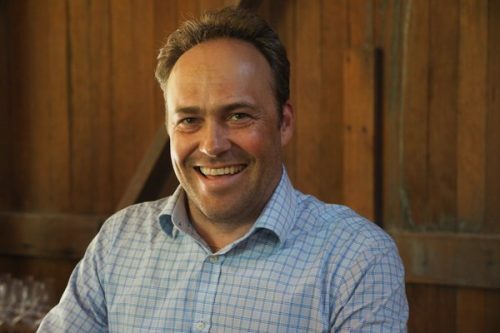 Hermann Wiemer retired from winemaking in 2004, and retired completely in 2007. 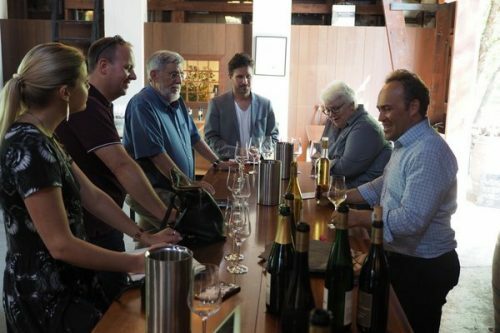 The winery was then sold to Oskar and the then winemaker Fred Merwath. Oskar studied agriculture in Sweden and also at Cornell in New York State. 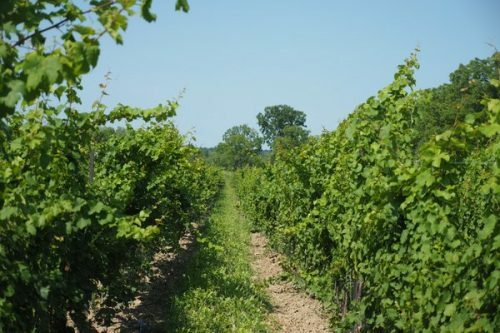 Weimer has vineyards on both shores of Seneca Lake. It is the deepest of the lakes at 200 m depth so it has a better temperature-modulating effect, and as a result the vineyards around here have been the main vinifera areas in Finger Lakes. The main challenge is whether the wines survive the winter. This is why Cabernet Franc and Riesling have been such a focus, because they are extremely cold hardy. 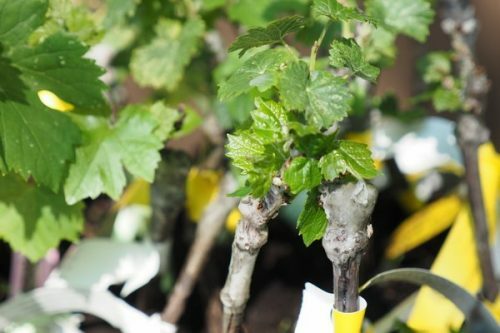 Also, another challenge can be surviving spring frost damage, so later budding varieties like these have an advantage. The air flow from the lake effect reduces disease pressure, and the lakes help the seasons drag out which buys hang time. Ladybirds can be a problem here, and in 2013 this was a particular issue. 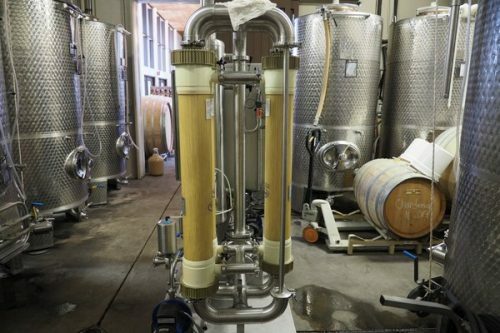 If they get into the ferments they can taint the wine, causing an unpleasant greenness. There’s a neighbouring farm with soybeans, and when these are harvested the ladybirds head to the vineyard. So Wiemer have purchased a vibrating sorting table to help get rid of any left on the bunches. Grape berry moth is a problem too, and unfortunately people aren’t allowed to use pheromones for sexual confusion in New York State, which would help a lot. The vineyards are on glacial-derived soils so there is lots of variation around the lake. Over the years Wiemer have figured out where things grow best. 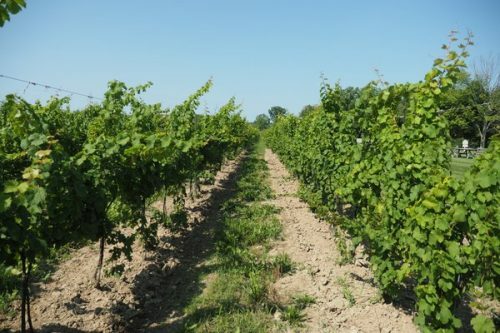 The northern sites have much deeper soils and are more vigorous, whereas some of the other vineyards are almost pure shale, and much less fertile. The grapes are hand picked in many stages, to capture the nuances through the harvests. There are a lot of small fermentations going on. They also separate the pressings. The dry Riesling has 30 to 40 different lots of wine in the blend. There is no inoculation here. So the later picks – in October – are much slower fermentations because of the temperature, which dips significantly at this time of year. Also there is longer time between the last spray and the harvest for the later pickings. The fermentations take six to eight months. It get’s very cold in the winter, and then they take off again in spring. 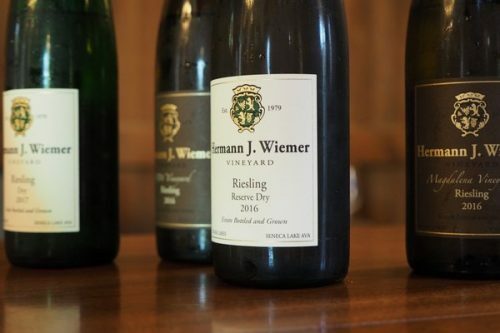 Wiemer don’t use sulfites on the press pad, because they are relying on wild yeasts. They work quite oxidatively and this also helps stabilize the wine. They like to work with pure juice and so they rack before fermentation. Everything is farmed organically and there are 10 acres that have been farmed biodynamically for the last four years. These are very impressive wines.